lowering mouse defense is not enough. number of mice in a squad matters not. a real enemy, are the major complaints. I think lowering the defence helps - the 20 defense, along with the previously available rapport from Gha Nachkt - were/are the two things that make Mouse walls attractive. If they had a 16 defense, you'd probably start seeing other fodder like Rodian Brutes and Diplomats used for fodder walls instead. Fodder walls are part of the game - it's good play to wall off your big shooters from opposition melee. It would be good to get Mouse Droids to the point where they're not the automatic fodder of choice, but I don't know if the balance team can take it any further than that. So Han shooting a Mouse in front of a Rancor is more nuts than Han shooting an Ugnaught Demolitionist or Rodian Brute in front of a Rancor? If the goal is to make it so no small or medium bases block line of sight from huges, that's a COMPLETELY different issue than any problem with the Mouse Droid. If the Mouse has the same defense at the Rodian and both always cost 3 points, those squads that play a ton of mice will just play a ton of brutes and nothing will be different. (ETA, because I lost my train of thought and didn't come back to finish this) If you specifically make it so Mice don't block shots but Brutes do, same thing. We aren't talking about making it so characters don't block shots for other characters. We're talking about making the Mouse Droid less of a presence in the game. Making it worse as a blocker than the Rodian Brute does that. My other thoughts: Boba is alright, he's comparable to Cad Bane and they'll each be better than the other in different metas. Banning the Imperial Governor is bad. If we're banning pieces because it "isn't worth errata", then the CDO and Neo Officer and Poggle should all just stay banned. I would be massively disappointed if the balance team gave errata to a bunch of stuff but then got to the Governor and said "Eh, kark it, not worth it" and just banned it forever. I don't even care much about the piece, that just seems like a massive failing of the team if we're already granting that design erratas should happen. Preventing Bribery and Reinforcements from being in the same squad is super contrived. Marn is the Bribery piece that is a problem; if Marn needs to be errata'd, give errata to Marn. This feels like solving the Mouse Droid by making it a rule that Mice can't be played with tempo control. It's dancing around the problem and restricting the game and the design space needlessly. Preventing reinforcements and bribery would be a floor rules change, not an errata for cards. Therefore, it's totally fine if it's "contrived". It's not in universe, it's only for competitive play. Just like we did with 2 pt pieces. Marn is an issue, but not the only one. Reserves must be talked about too. IMO you shouldnt be able to have both Reinforcements and Bribery in a squad, but i dont see an issue with having Multiple Reinforcements. Most of the TIme it isnt played anyway, and it tends to not be competitive because it realy doesnt maximise a squad to have a bunch. As to Reserves, what pieces are the problem on this? i have not seen any issue with them generally. They still give points when you bring them in so it can cause you to lose more points than you counted for. Also if we make them Null in Competitive play, what is the point in using the ability at all. Think of how Rigid works. We quit putting it on pieces as it would not have much point anymore. I dont play Reserves squads anymore, but i still dont feel that they should be nerffed in this way. Actually the biggest issues are San Hill and Ozzel. Not played for their reserves and already power pieces. Then a single roll can completely reverse a game. Reserves should really never be on to tier competitive pieces. And really, would anyone be sad if San and Ozzel were taken down a notch? Once again this is only for competitive play. The other reserves squads are usually just for fun (as they should be) and will remain as such. an uggy or brute, has a chance to attack, thus a real character. why shoot a mouse, when a real threat, is just behind it? mouse droids are sooo small,about 17x8x10 inches, they shouldn't effect targeting options. Am I the only one that sees the logic behind this? Last edited by RaginRancor on Mon Aug 24, 2015 10:23 am, edited 1 time in total. R-7's have a small base, yet they are way bigger, maybe 10 times, as large. Not a combat threat. 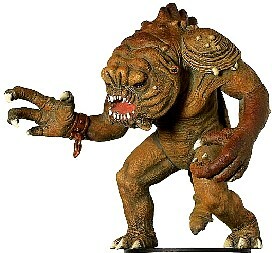 Not going to block the view of the Rancor. I doubt this is unbiased, but I don't think it needs a change. If it is changed, changing it to once per turn as Jason suggested is probably better than disallowing pit movement. Disallowing pit movement would introduce an entirely different type of "involuntary movement", which is another rules complexity. (Every other type of involuntary movement would then beg the question: "Is this Push-type involuntary movement or SBM-type involuntary movement?") Changing it to "once per turn" would keep the change localized to SBM only. If SBM just gets a glossary re-write so it specifically states not allowing the movement into illegal squads there is no issue. Pull, push, rout and repulse are all involuntary movement where the direction is constrained and they can stay as they are. SBM has free range and its very powerful when you add in pits. I feel that the synergy with Mines is enough to keep SBM a competitive option. I think once per turn would hamper the ability far more than preventing pit saves. Preventing pit saves eases pressure on map selections and takes away the most cheesy aspect of SBM. Not only that but it wasn't really the intention of the design of SBM. It was supposed to be reflective of Cadeus able to predict the battle and strike at the opportune time than him having the ability of moving people into pits. With it being unlikely that many more restricted map will become available (as Matt doesn't want to do them and Chris West classically makes maps where the majority fall to standard or open) I would rather not have pressure to exclude maps with pits from restrictive. Its seems a simple change to me that really only takes the most abusive aspect of SBM away. As for Boba, my only suggestion would be removing Wrist Cable. If SBM just gets a glossary re-write so it specifically states not allowing the movement into illegal squads there is no issue. Fair point, and all true. SBM is competitive with just Mines - no pits needed. Reducing to once per turn would hurt the ability more than removing pits. I was just thinking of what would keep the rules simplest. Someone (I think Daniel) had mentioned a wording difference between SBM and Push and using that as a basis for the change. "Push back" versus "move". If those terms are treated as two different types of involuntary movement, it would confuse things. Rout uses "move" but then the glossary says "use the same rules as for pushing". Possibly other issues - I didn't look that closely. But if it's just a change to the glossary for SBM specifically excluding pits, that would also keep the change to one ability. I'm opposed to a new rule that introduces two types of involuntary movement, but if it's just a glossary change for SBM, I like that better than reducing SBM to once per turn. The only size that matters in SWMs is small, medium, large, huge. It's an abstraction. Take a look at some comparable larges for example. There's some that are merely large humanoids, and some that are huge speeders. Walking Droid Starship same size as an Uggernaught? Lol. to the satisfaction of the majority, the game will lose players. Go back to bloomilk. Threats aren't winning you friends. Balance team isn't beholden to threats of players leaving if they don't get their way. And I'm done discussing it now. Tiny could simply be defined as: This piece doesn't block movement of enemy characters or proved cover. Simple easy and makes sense. I can't think of any other piece in the current game or anything that we might make besides maybe a holocron would be tiny. Bill, geez! wasn't trying to piss anyone off or make threats. I'm just stating facts, based on conversations I've had. I thought calm debate was allowed on Gamers. I really don't understand the anger. sorry, but I'm not trying to win friends, but trying to help the game evolve. Last edited by RaginRancor on Tue Aug 25, 2015 3:17 pm, edited 1 time in total. Change Twin to Double in the CE. If nobody plays the squad again on a competitive level, that's great. It discourages engagement, lengthens games, prevents 3 pt wins, encourages lockouts, etc. Bad for the game. several are very bad for the game. Unfortunately it's not the vehicle SA that is the problem. It's high HP Strafers and Galloping Attackers. I don't think anything can be done with them now. We as a design team need to just stop making them. I lumped it in with the reinforcements/bribery conversation, but it deserves its on discussion. At the very least the SA should be null in competitive play. But there is an additional advantage to only allowing one instance of reinforcements/bribery OR reserves in a squad for competitive play: San Hill and Ozzel get weakened. If this floor rule goes into effect, out activate and smash gets hurt, which most everyone would like to see happen. A squad then cannot include Ozzel/San and Lobot (very common combos). San Hill and Ozzel are power 11 pieces that are used more than any other reserves pieces in competitive play. This rule would effect other reserves pieces much less, since most other reserves pieces either are not competitive already or aren't used in tandem with Lobot/Marn Etc. Last edited by TimmerB123 on Wed Aug 26, 2015 1:07 pm, edited 1 time in total. Both of these are being discussed/vote on. With Vehicles (namely durge, grievous and Luke/leia) are likely not going to change for the reason you state. You will probably be happy with the balance teams direction.